Beans, Beans, They’re good for your heart, The more you eat them – the more you…..
That’s pretty much all I knew about beans. Which is not really saying much! I believe the song to be very accurate because beans are said to be good for your heart as well as leaving you the urge to…. I am cracking myself up here, people. Trying to stay focused…and moving back to the topic at hand. I had NEVER eaten beans, there was just something about the texture that grossed me out. With that said, a couple of months ago I put on my big girl pants and made myself try them. What I found out was that I really loved beans – imagine that! Who would have thunk?? One of the reasons I believe I am enjoying these beans is because of the way they have been prepared. They are packed with flavor and cooked to just the right consistency for my family and I. 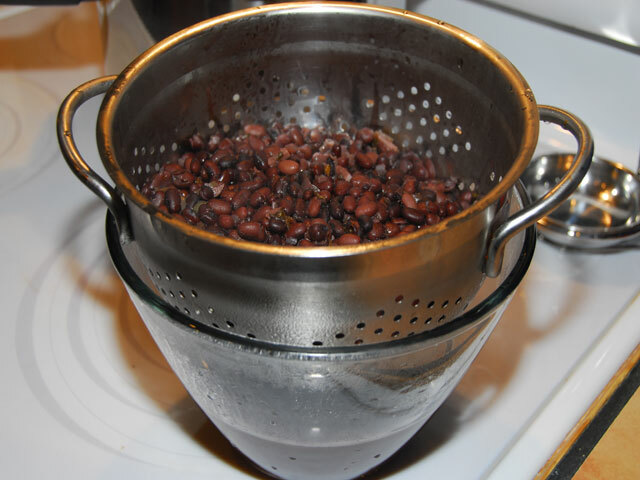 You should know I prefer to use a pressure cooker to prepare my beans. 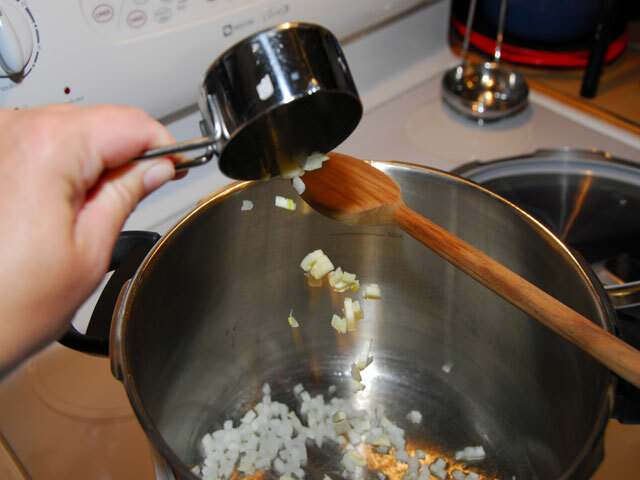 You can of course use a traditional sauce pan, however you would have to adjust the cook time. No biggie – they will work either way. 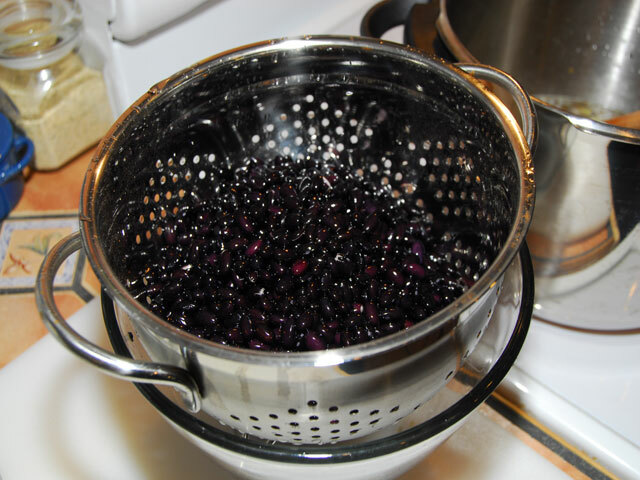 IMPORTANT: You will want to soak your beans for 4-8 hours before you cook them. As seen in the photo above. ALSO IMPORTANT: The ingredients go into the cooker pretty quickly so it would be wise to prep all the ingredients prior to turning on the stove. Turn your stove to medium hight heat – #8 on my stove. 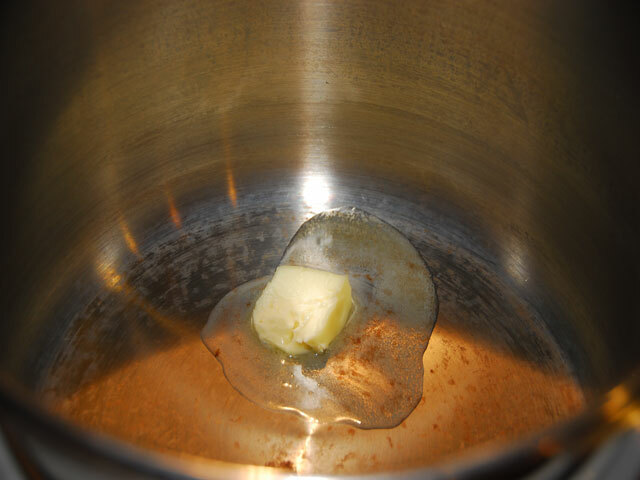 Add butter to your cooker and melt. Now this is a handy-dandy device I have fallen in love with! It makes quick work out of onions and all my other vegetables. For a while I was a knife snob. 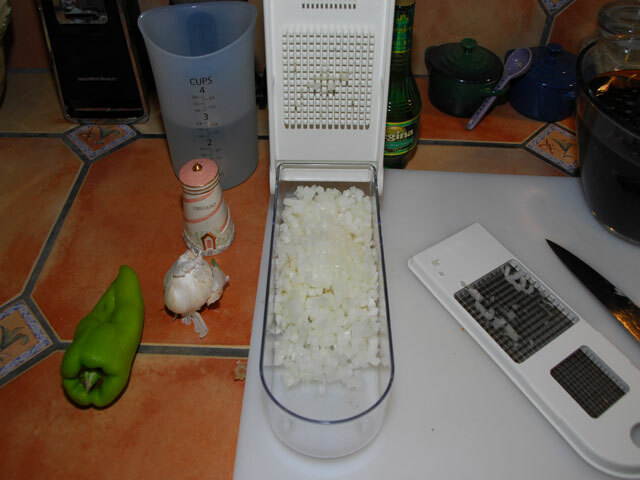 I thought by chopping everything by hand it was somehow better – because so many people refuse a tasty dish based on the chopping technique of the chef….so after I got over my Julia Child complex I moved onto this little masterpiece of a time saver. The only thing I regret is not finding it sooner!! Back to the recipe – Chop 1/2 an onion, please. Here is an extra photo just so you can see how perty my onion looks…You’re welcome. 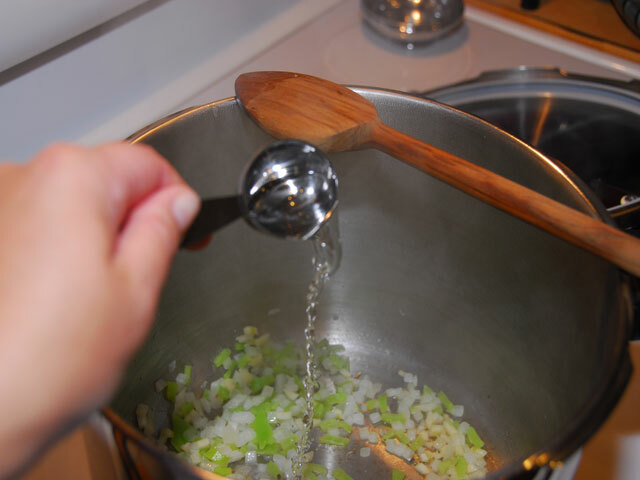 Place 1/2 cup of chopped onions into your cooker. 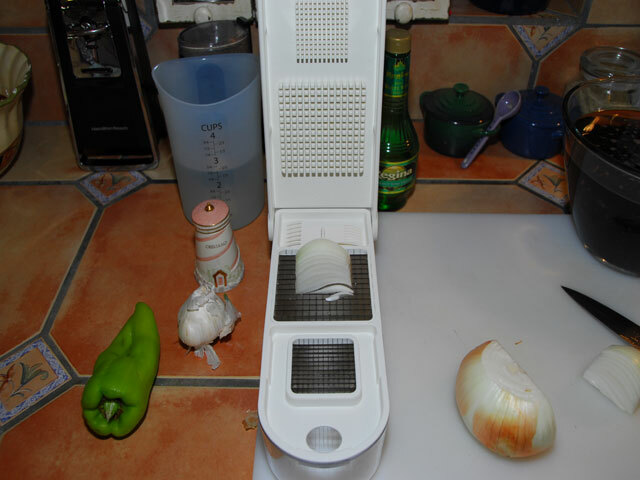 Followed by 3 diced garlic cloves. Followed by 1/4 cup cubanelle peppers diced. Let these ingredients sauté until you can really smell them. About 2-3 minutes. We are not caramelizing them we just want to release their flavors. 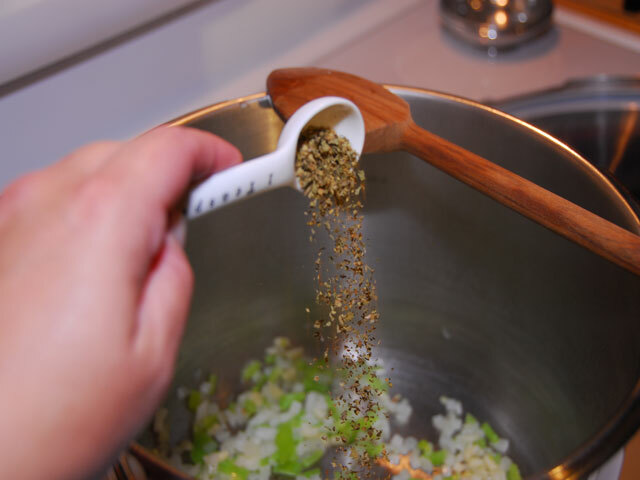 Add 1 tsp dried oregano. Followed by 3 tbsp of white wine vinegar. Let this cook for another 2-3 minutes. Followed by the mushroom broth. Drain the beans. You do not need to keep the water the beans soaked in. Add the beans to the cooker. Crank the heat to high and bring to a boil. 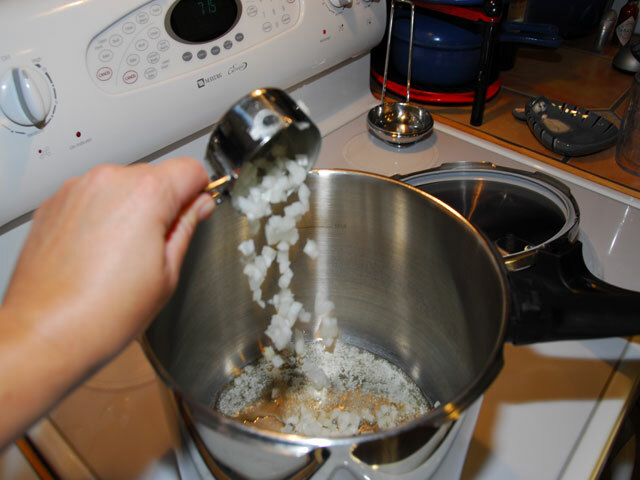 Above is a photo of a pressure cooker. Which I assume you figured out already, but just in case – that’s what it is. I use a stove top version. There are also electric versions, however I find you really don’t save that much time with them since it takes quite a while for them to come to temperature. Again, what ever you are more comfortable with is what you should use!! I want you to be happy!! 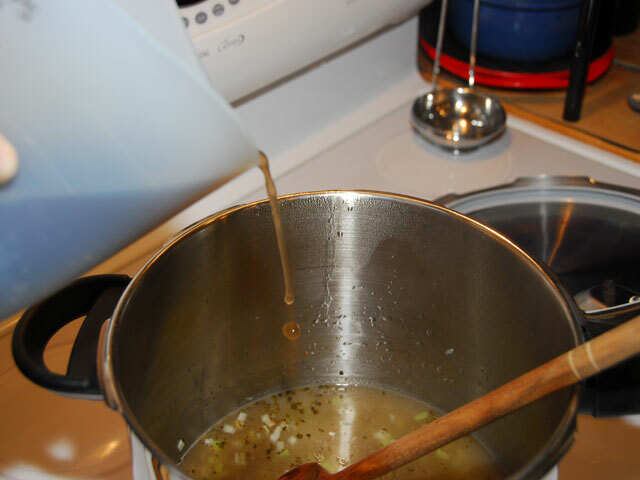 Once the liquid is boiling place the lid on your pressure cooker. Drop the temp to medium high. Once the pressure indicator pops up that means you are at the right pressure for cooking. This is when you start your timer. 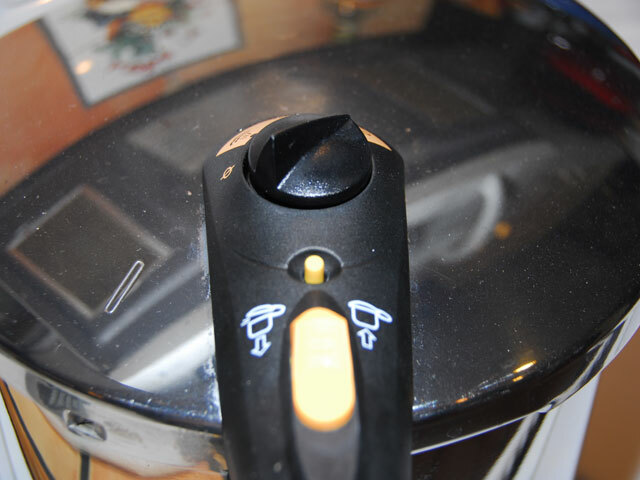 Once the timer rings pull your cooker off the stove and empty the steam. Be very careful when releasing the steam from your cooker. If you touch the steam it WILL burn you severely. I wear oven mitts just to be extra cautious when handling the cooker and order everyone, and I mean everyone – even the dogs, out of my kitchen – better to be safe than sorry!! This is what it will look like when you open the pot. Always take a test of your beans just in case you want them cooked more. Once you are satisfied you can pour your beans into a container or separate the beans from the liquid. DO NOT throw away the liquid – This liquid is like GOLD!! 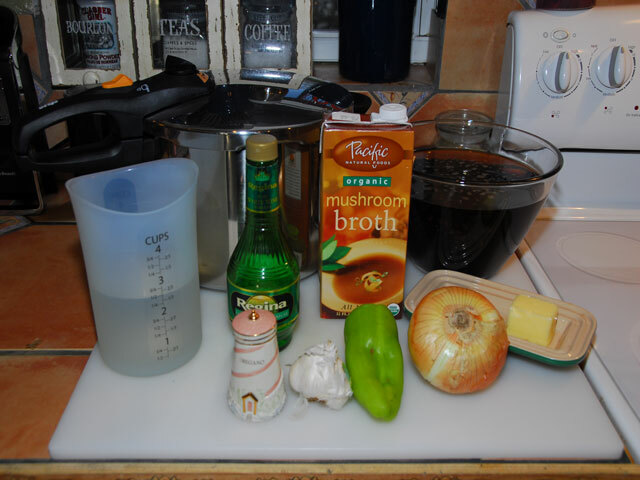 Black bean juice is great to use in lieu of stock or water in all sorts of recipes!! 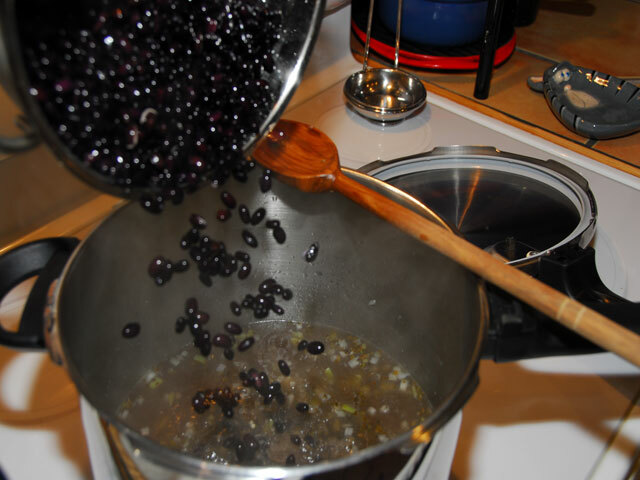 And there you have it – The best black beans…If I do say so myself, which I actually did say ~ so, you get it right? – Anyway they’re goooood. Until next time…A word of advice – Don’t eat beans on your first date or you might really “toot” your own horn!! Still cracking myself up – Good grief ~ someone stop me!! Be blessed, stay blessed and remember if you don’t laugh at yourself someone will do it for you!! MAKE SURE TO SOAK YOUR BEANS FOR 4-8 HOURS PRIOR TO COOKING. Place pressure cooker on stove and turn heat to medium high. 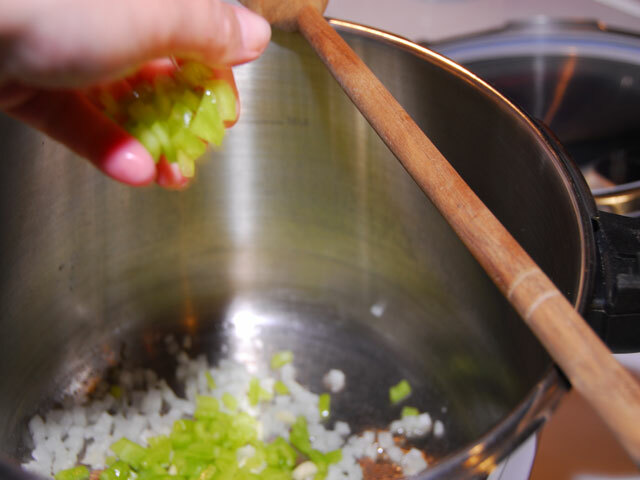 Add diced – onion, cubanelle pepper and garlic. Add dried oregano and white wine vinegar. 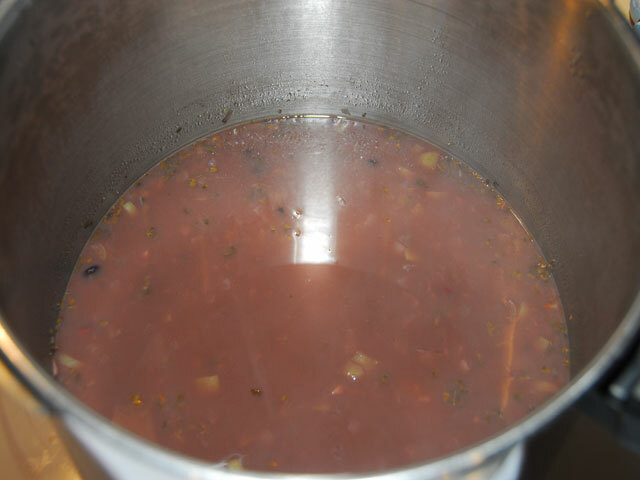 Drain beans and add to broth. 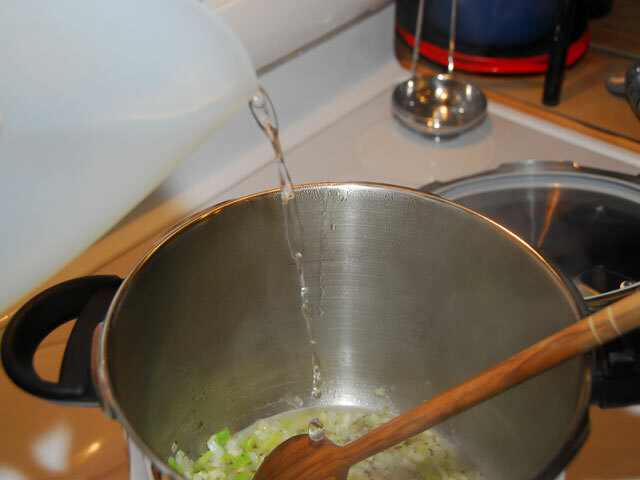 Once liquid is boiling place lid on cooker – secure properly. Once pressure indicator is ready – drop temp to medium high. Pull cooker off stove and depressurize. Separate liquid from beans if desired or store together. Welcome to another beautiful day!! Fun Fact…I’ve been right there!! Where is there you ask…Exton, Pennsylvania. The video you’re about to view was filmed at the drive-in movie theatre I used to visit as a kid. What fun drive-in movie theaters were. I remember all the fuss when The Hooters were going to film this video. My best friend’s sister went to the video shoot – it was 1985 and she was waaaayyy cool. I hope you enjoy this as much as I do!!! Until next time…Remember you’re never fully dressed without a smile. Be Blessed, Stay blessed and remember if you don’t laugh at yourself someone will do it for you. Can you guess where these beauties are from? 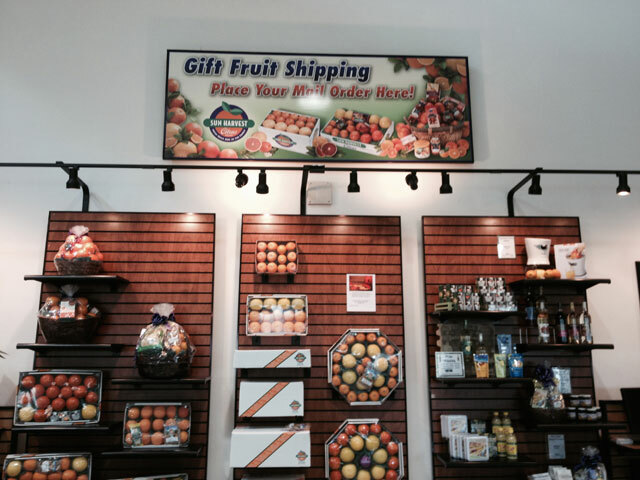 Sun Harvest Citrus in Fort Myers, Florida is a magical place that our family loves to visit as often as possible. 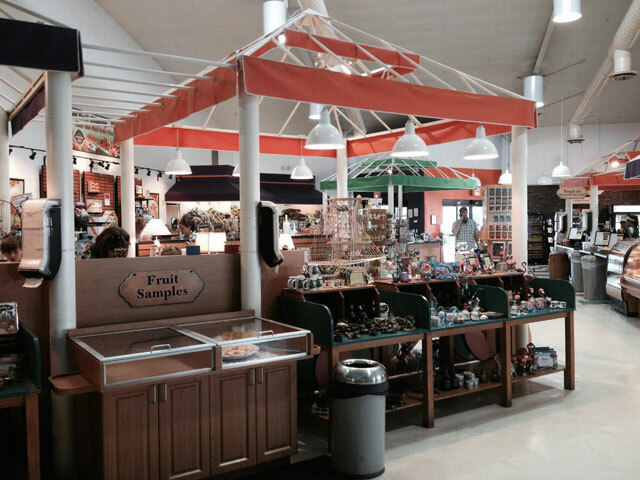 Besides having the best oranges and grapefruits in town, they also have a spectacular gift shop, bakery, post office, various juices, ice cream, free juice samples and so much more. Fair warning ~ Don’t be in a hurry when you visit because there is plenty to keep everyone entertained. 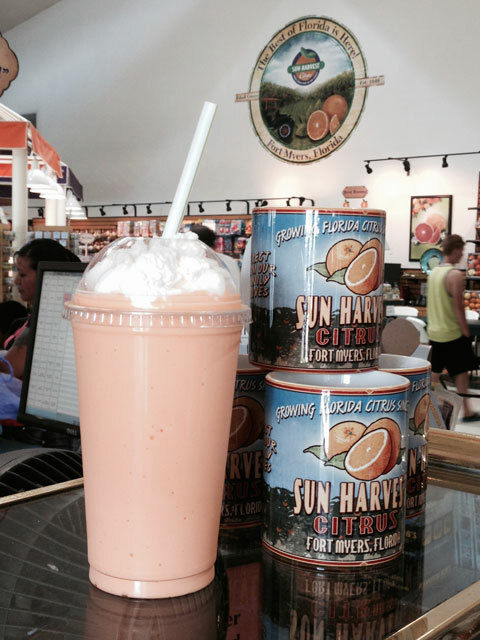 First and foremost, Sun Harvest Citrus makes the most phenomenal milkshakes – period! Our family favorite is their orange milkshake that taste like a creamcicle. If milkshakes are not your thing, they also have soft serve ice cream in several different flavors as well as a vast assortment of decadent pastries. Let me just say, YUM! Second, Sun Harvest Citrus hands down makes the best orange juice. But here’s where things get even better – they don’t only make plain orange juice (which is spectacular unto itself). Oh no…they step it up a notch by combining Strawberries with Oranges and Cranberries with Oranges taking OJ to the next level. You must taste to believe, my friends. These two juice variations are ah~mazing. Here’s some more good news, you can purchase their juice on site. If you’re not sure which one you prefer, no problem, they have that covered. There is an entire tasting station devoted to sharing their juice with you at no charge. Taste away and leave with your favorite juice in a half or full gallon. Bring your coolers, because you’re not going to leave with just one, trust me. 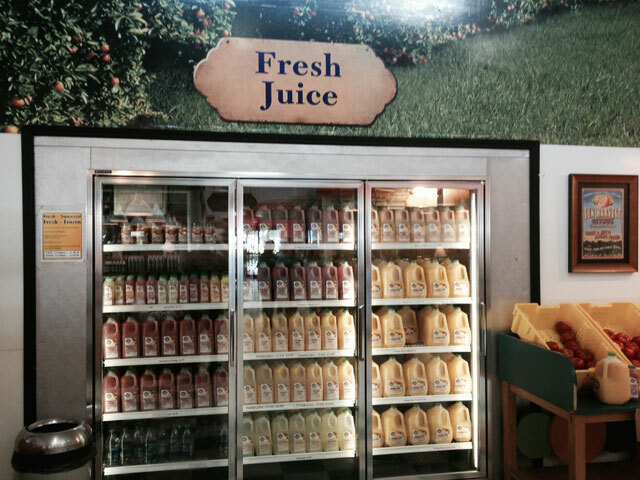 Fun Fact – Their juice is made on site. There is a glass partition that separates the juice plant from the store. 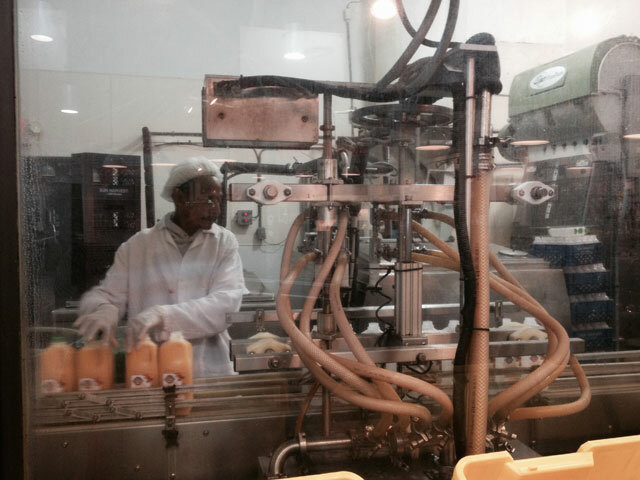 You can watch the employees packaging the juice which is pretty cool for both kids and adults. It’s kind of like an aquarium, but instead of fish there are people and instead of water there is juice. So basically it’s nothing like an aquarium…it’s just a glass partition. Still it’s fun to watch! 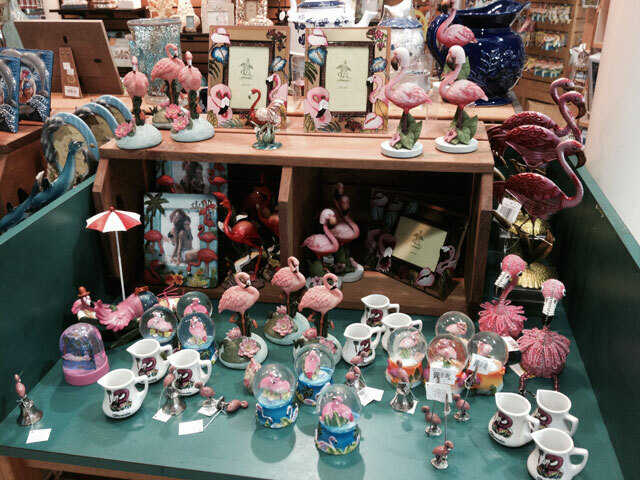 They also have this fabulous gift shop where you can purchase all kinds of things you don’t necessarily need, but surely will want. And then you can mail them to friends and family at the US Post Office that is housed inside the building. These people really know how to make things easy. Last but surely not least ~ You can even send fruit to people you love. Everyone knows nothing says “I love you” like a basket of fruit. Well…maybe jewelry – but for the sake of this post let’s just stick with fruit. Their fruit boxes come in a wide variety of arrangements, making it easy to pick the perfect gift for pretty much anyone, especially for those “impossible to buy for” people. So there you have it. If you are visiting Southwest Florida this should absolutely be on your list of things to do. Let Sun Harvest Citrus provide a break from the heat and entertain you for a while ~ you’ll be glad you stopped by. Until next time…Be blessed, stay blessed and remember if you don’t laugh at yourself someone will do it for you! For additional Information or directions you can click on this link (Sun Harvest Citrus) or contact them directly at 800-743-1480. 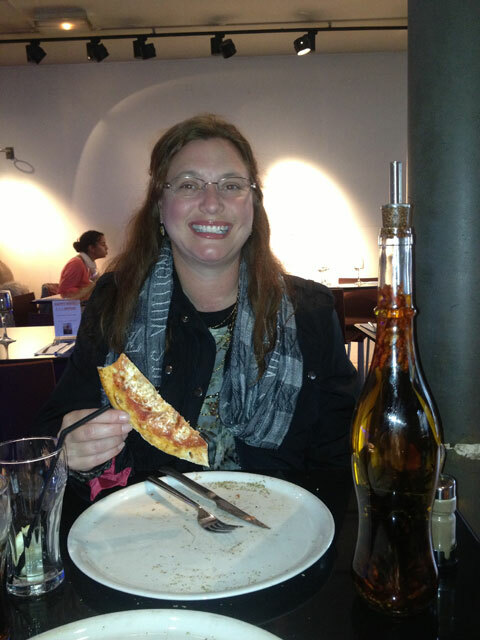 Pizza in Paris – Pizza Marzano is Ooh, la, la!! I consider myself somewhat of a pizza aficionado. My qualification are as follows – I’m an Italian from Jersey. Clearly, my qualifications speak for themselves. Even so, I’m not a pizza snob. I will entertain any and all pizzas with various crusts and toppings – such as but not limited to, thin crust, thick crust, cheesy crust, just cheese, lots of veges and white pizza. Are you hungry yet? I hope so because I am going to introduce you to a little gem we found on our first few hours in “as magical as everyone says it is” Paris, France. Now I realize pizza may not be everyone’s first choice for dining in Paris, however, for my family it couldn’t have been a more welcome meal. 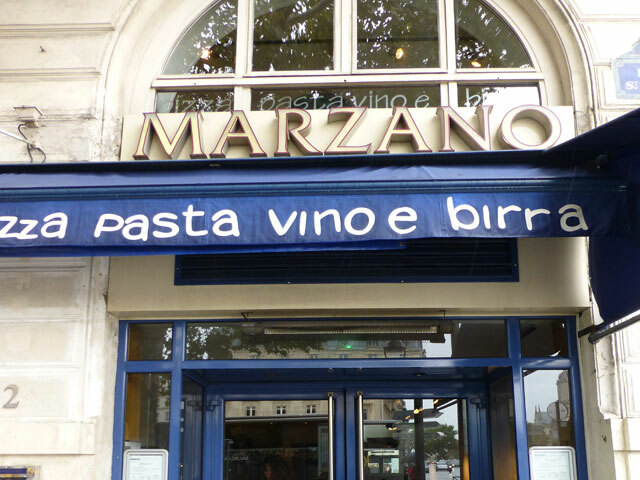 Pizza Marzano is located in Place Saint-Michel in the 5th arrondissement in Paris. 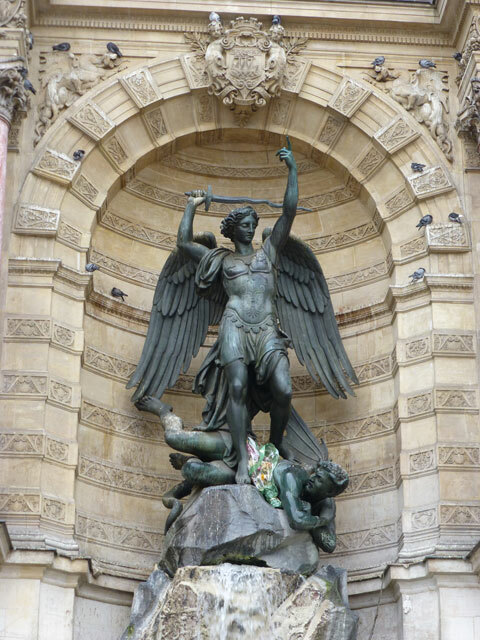 It is across from the The Fontaine Saint-Michel and walking distance from Notre Dame. It’s quite the hustle and bustle corner as the subway is also accessed at this location. Seeing as this was our first restaurant experience in France we were elated when our server spoke to us in English. That of course, was after we unintentionally butchered their lovely language. We are firm believers in speaking, or at the very least, making an effort to speak the language of the country we are visiting. We believe this illustrates how much we respect their country. In turn, we are always met with very gracious hosts, as was the case at Pizza Marzano. For our order we stuck with an oldie but goodie…a plain cheese pie. It was good. So good in fact, that we ate there a couple more times during our short stay. Their prices were reasonable and their restaurant was warm and cozy, which was fantastic because we were freezing! Between the local bakery, the Sunday market and Pizza Marzano we ate like kings! Our boys still talk about Pizza Marzano being one of their favorite restaurants. Imagine that, not even teenagers and having one of their favorite restaurants located in Paris, France. Ooh, la, la! 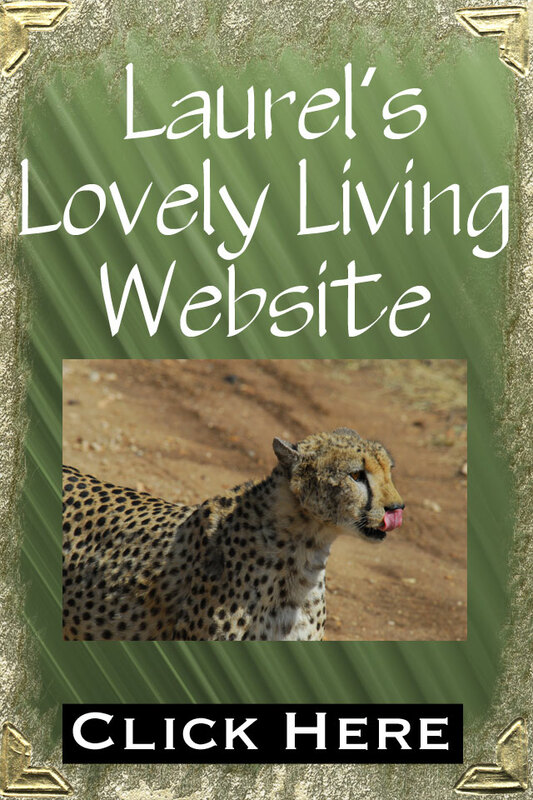 These are exactly the fun memories we enjoy creating with our boys. I’m very glad I was able to share this one with you. 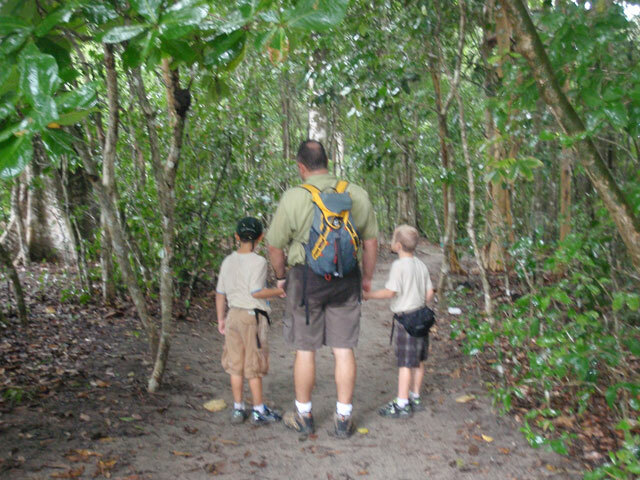 Our boys were 6 and 7 years old when they first visited Costa Rica. Before our departure we made the decision to gift them their own cameras. We bought them each their own digital waterproof cameras. Waterproof for obvious reasons – they are boys and they were 6 and 7…did I mention they are boys? Right, I did. Good, moving on. We labeled each camera with their name and encouraged them to take photos of everything and anything they pleased. Unbeknownst to us, we were about to return home with some of the most wonderful memorabilia of our vacation. Join me as I reminisce. These types of photos have become some of my favorites. Their ability to see past the obstructions made it possible for them to truly capture the essence of the city. These photos enabled us to recall the sites just as if we were driving down the streets once again, we were able to remember the stores we passed, the types of vehicles that were driven and how uninhibited the drivers were. Which is a polite way to say, they interpret their traffic laws more as suggestions rather than defined rules and they pretty much lack any semblance of order on the roadways. 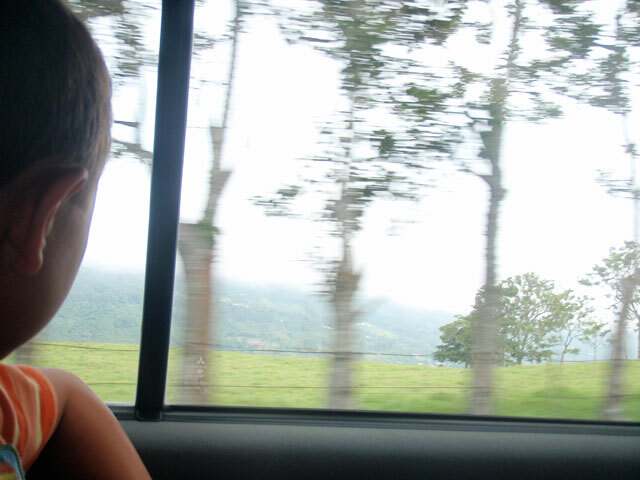 But HEY, that’s what makes it thrilling to drive around Costa Rica, in a weird take your life into your own hands kind of way. All of these intricacies are what comprise some of our most fond and funny memories. These details are what make each country unique. Details that are not always photographed by those of us who are older, but our little boys with their uninhibited spirits captured them expertly. Don’t just take my word for it – Give your kids a camera and see for yourself. 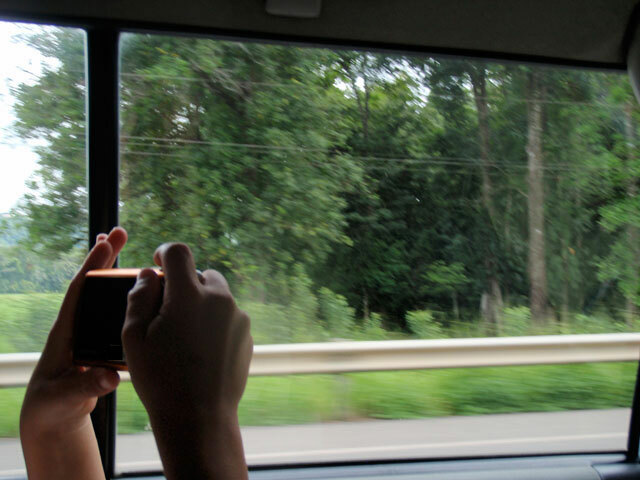 People taking pictures of people taking pictures ~ or in this case brother taking picture of brother taking picture. I just adore this photo. It will always remind me how small their little hands were on this trip. 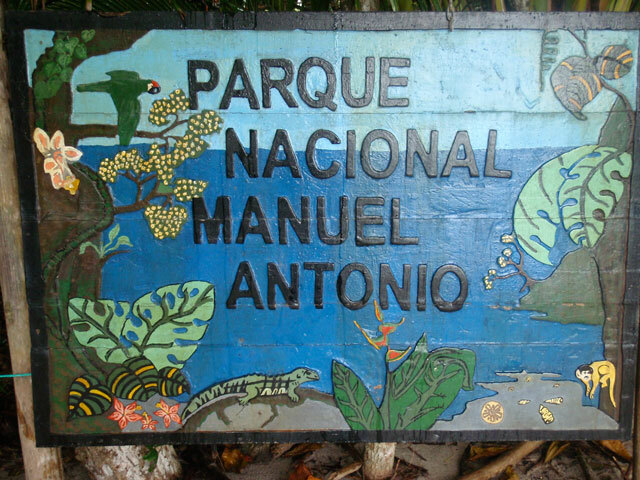 This reminds me of a sign we saw on our way into the Parque Nacional Manuel Antonio, most probably because it is the sign we saw on our way into the Parque Nacional Manuel Antonio. Coincidence, I think not. Wait…What? Our first morning in Costa Rica we were greeted with this view. 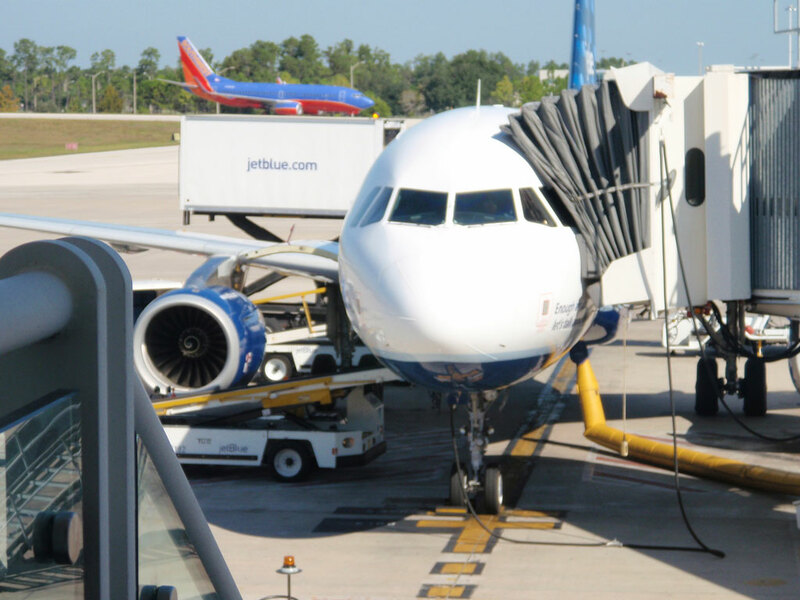 At this point I remember wanting to cancel our flight back home, sell everything we owned and move immediately. FYI – We didn’t cancel our flight home, we still have everything and a whole lot more and we’ve never moved. But we do have this photo. So, obviously it’s a win, win. 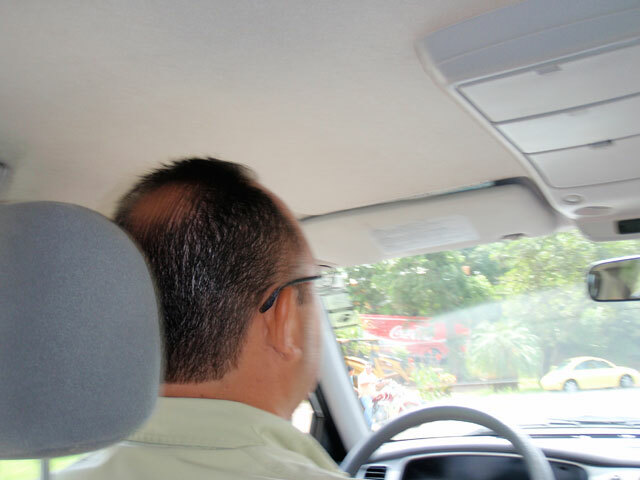 When I look at his photo I think I should have brushed my hair and that my husband is a very safe driver. It’s funny how you can travel to another country, yet years later when you are enjoying the photos you are most captivated by your children and how fast they’ve grown up. Their little ears, their tiny features – good grief I’m off to sob in the corner again. 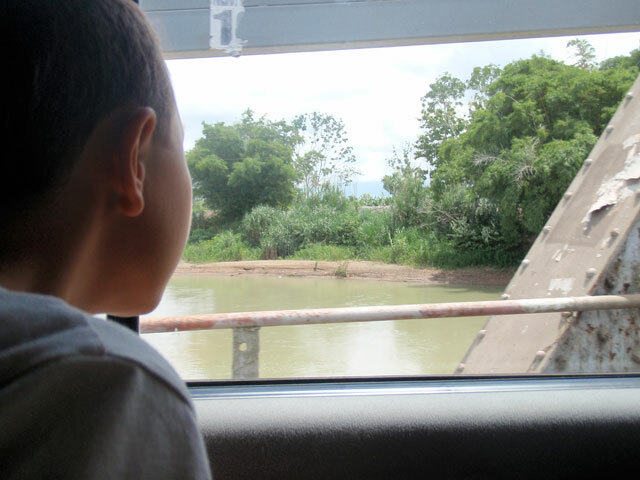 The Costa Rican countryside whisked by right in front of their beautiful little boy eyes. What a gift these memories will be for them. If your goal is to take photos of animals, give a child a camera. They can find animals anywhere!! I literally could be standing with a snake under my feet and a monkey on my head and I’d miss them both. But hey, that’s what I have my boys for ~ they’re mini ninja animal locators. Daddy…handsome, amazing, brilliant, mmmmm…what were we talking about ~ I’ve lost my train of thought! Pardon me ~ That often happens when I’m wooing over my sweetheart. Upon inspection, you will notice neither one of the boys took this photo. Upon further inspection and by process of elimination…you probably concluded it was me..if so you’re right! I wanted to show you the fanny packs our boys use when we travel. Upon a variety of other things this is where they store their camera for easy access. In truth, I just wanted another opportunity to look at my handsome hubby and cute kids…what can I say, I am clever like that. 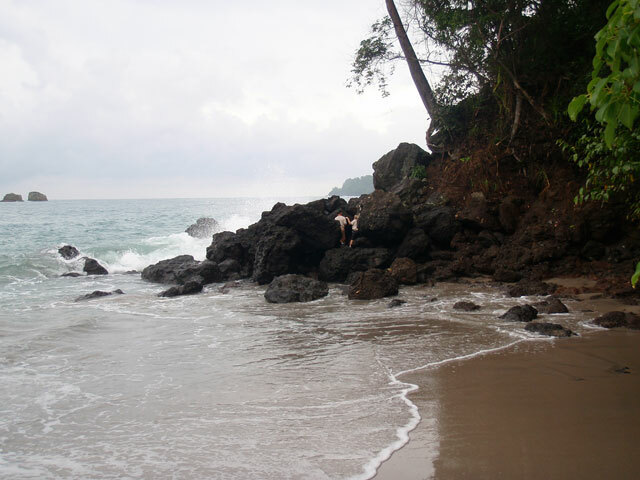 Sure kids, go climb on the jagged rocks in a foreign country with no medical care close by. Have fun! 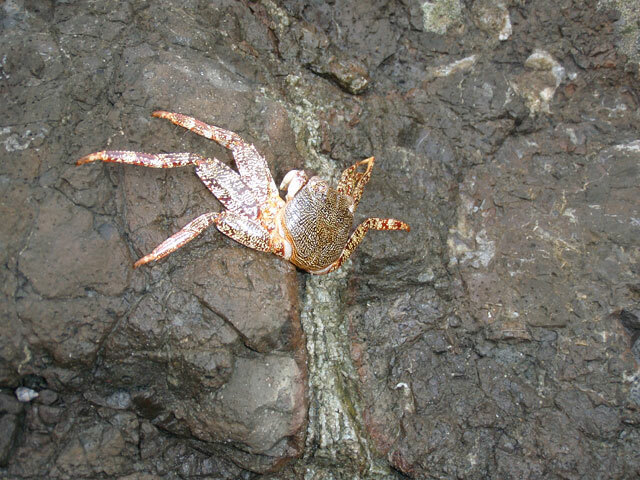 Before you lay judgement, please note this was clearly solid parenting and well worth the safety risk as we were able to bring home this glorious photo of a dead crab. Until Next Time…Give your kids a camera and see the world through their eyes. You won’t regret it! 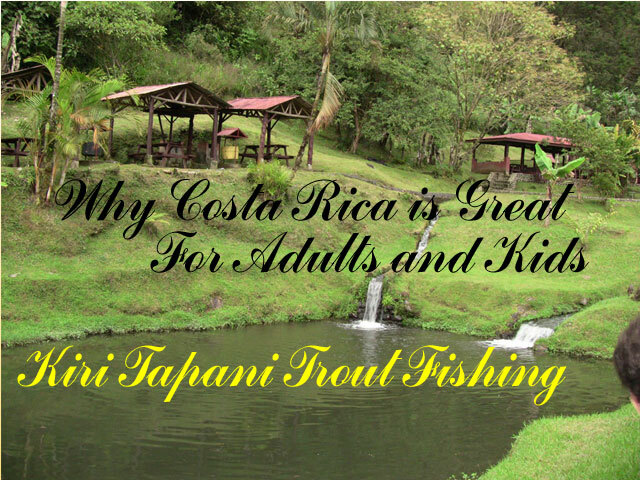 Why Costa Rica is Great For Adults and Kids! Kiri Tapanti Trout Fishing! 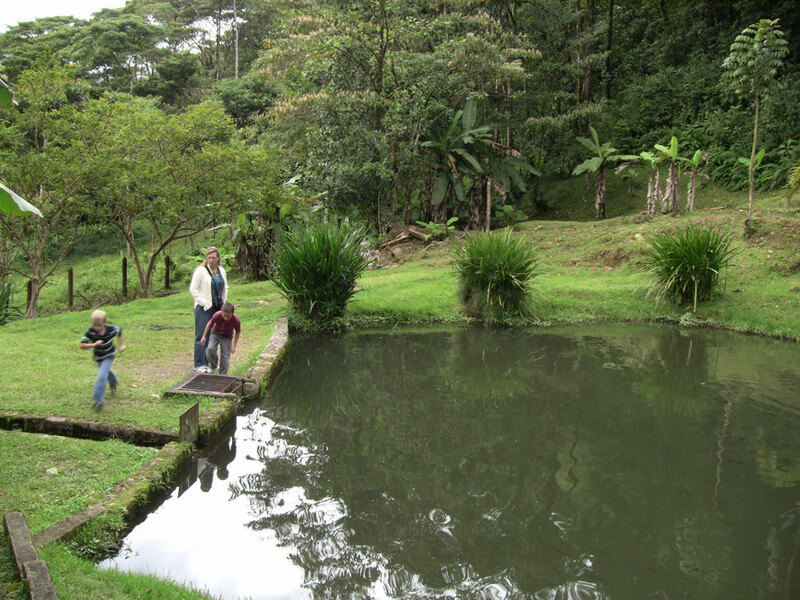 I thought I’d share a wonderful little place our entire family enjoyed when we were in Costa Rica. 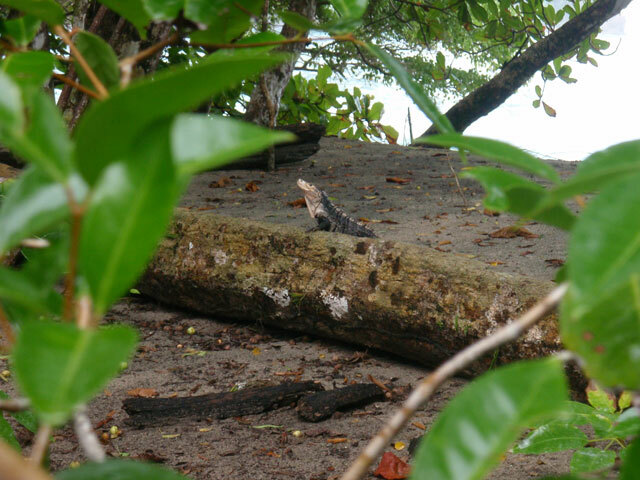 If you haven’t been to Costa Rica before then you are in for a real treat. 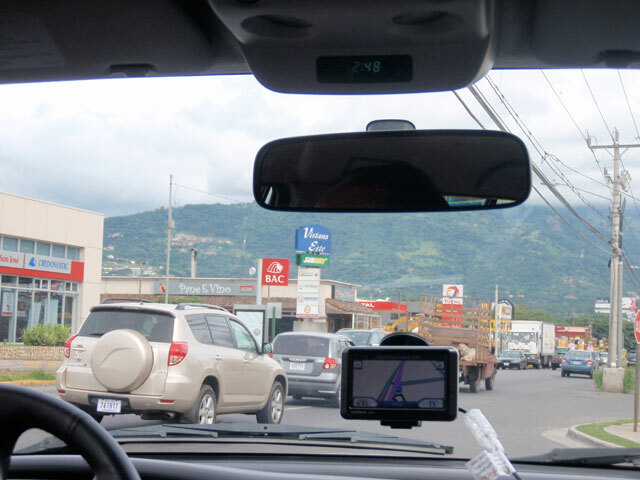 At the risk of stating the obvious…this how we travel to Costa Rica. 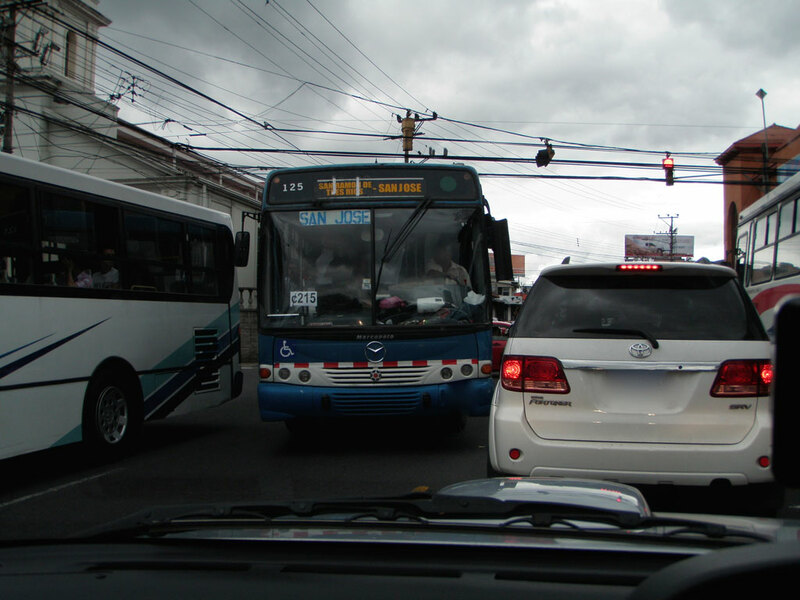 Fun Fact…In Costa Rica the laws of physics do not apply – two object can actually occupy the same space at the same time…who knew? Ah, I just adore the hustle and bustle of the busy San Jose streets. 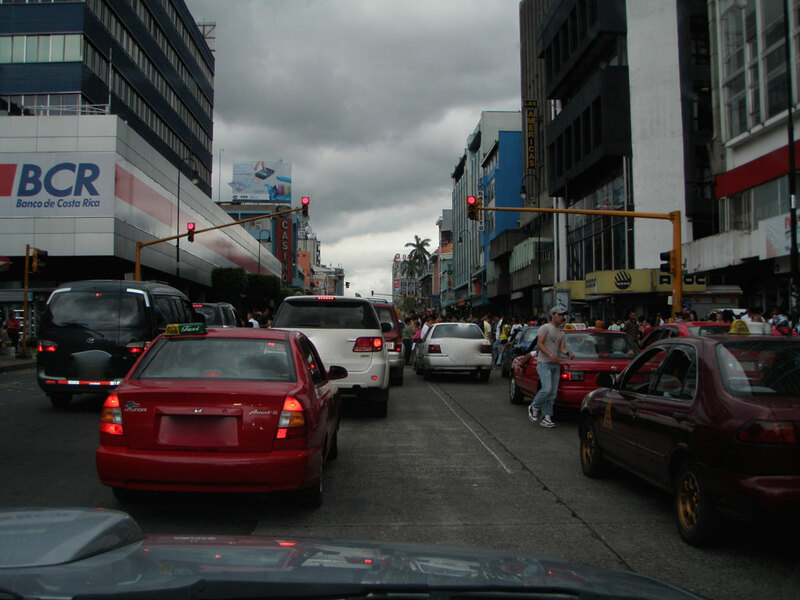 San Jose is the capital of Costa Rica. 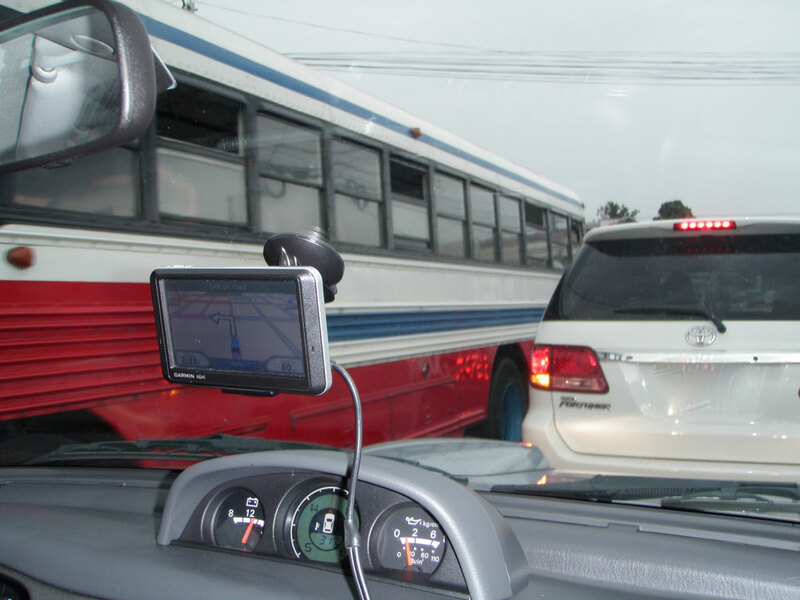 May I also draw your attention to the complete disregard for any assemblance of traffic etiquette. 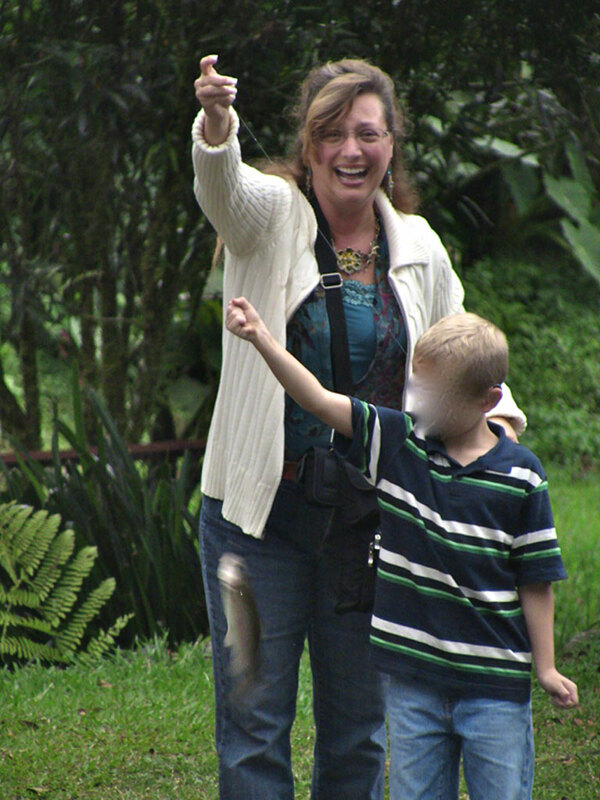 Ironically, this is one of the aspects that makes Costa Rica even more entertaining. Driving in this small country becomes a wonder unto itself. We are going to turn left. We love Pops!! 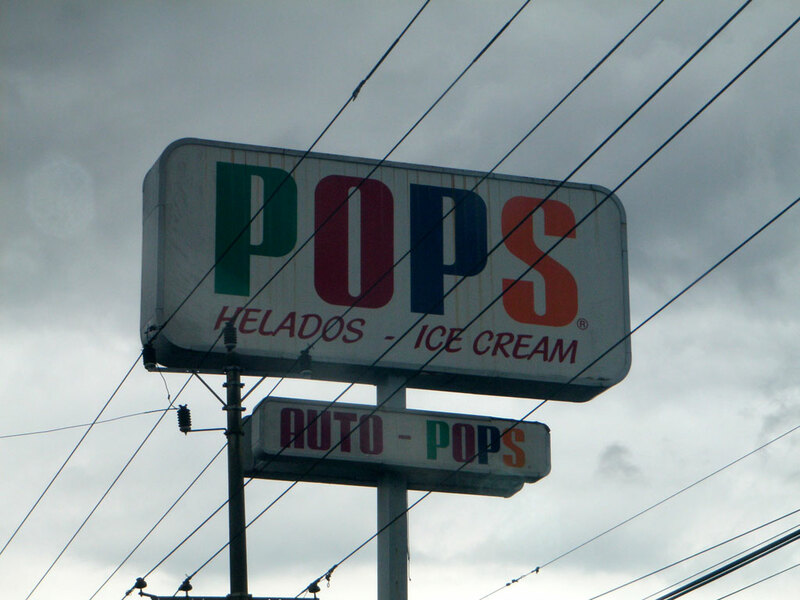 They are located throughout Costa Rica and they have the best ice cream!! 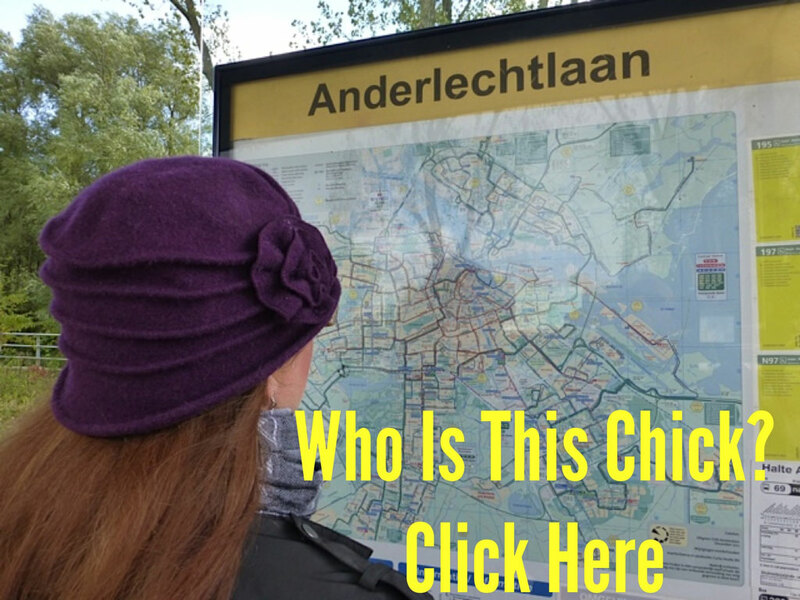 Important Travel Tip – While traveling always know where to get the best ice cream!! Always! You will thank me for this later. This is my “kids are getting too close to the water” face!! I have many faces, in time you’ll understand why. 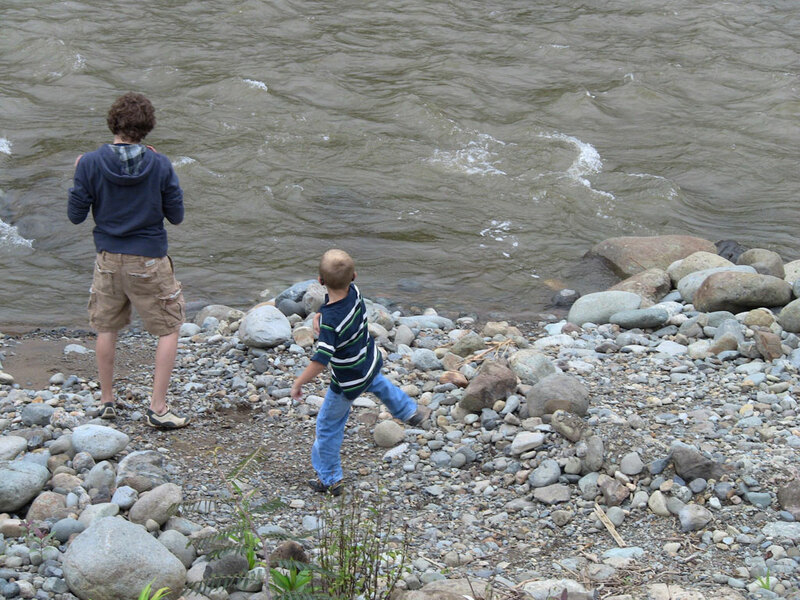 My youngest with his cousin throwing rocks. Which leads us right back to why I have so many “faces”. This little gem is the Kiri Tapanti Mountain Lodge. 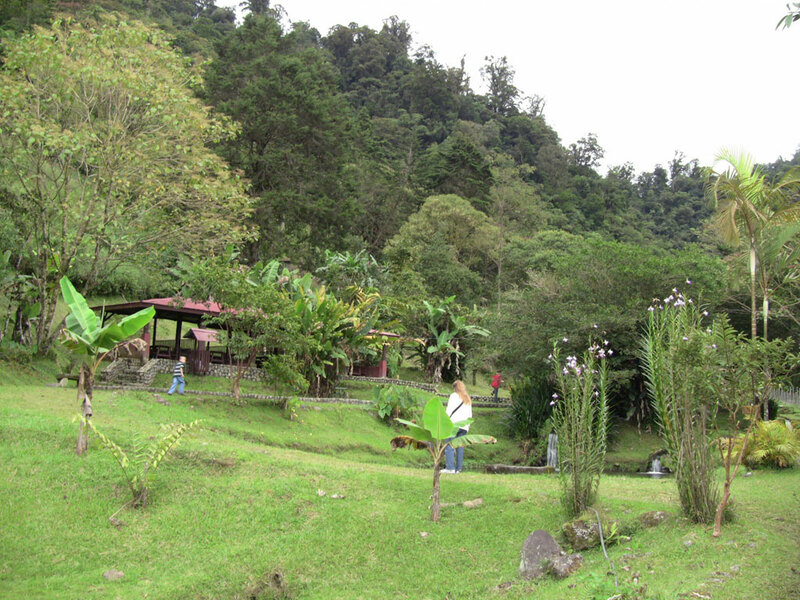 It is located about an hour by car out of San Jose, in the Orosi Valley of the Province of Cartago. 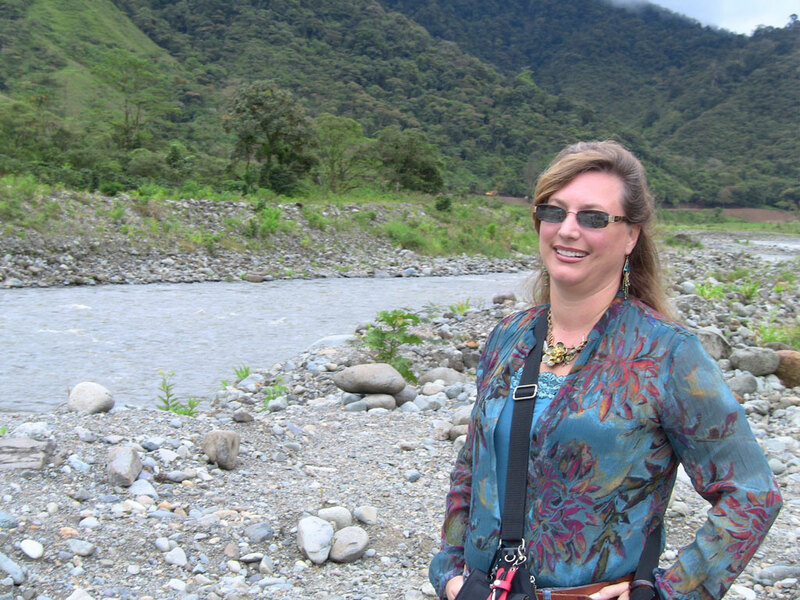 Once you leave the city, the magic of Costa Rica really starts to unfold. 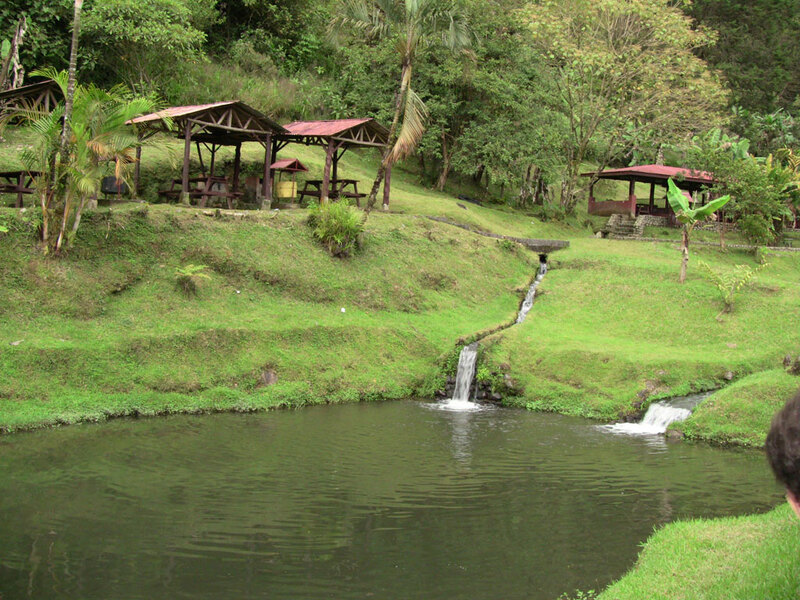 Lush greenery, waterfalls, mountains and some of the nicest people you will ever meet!! 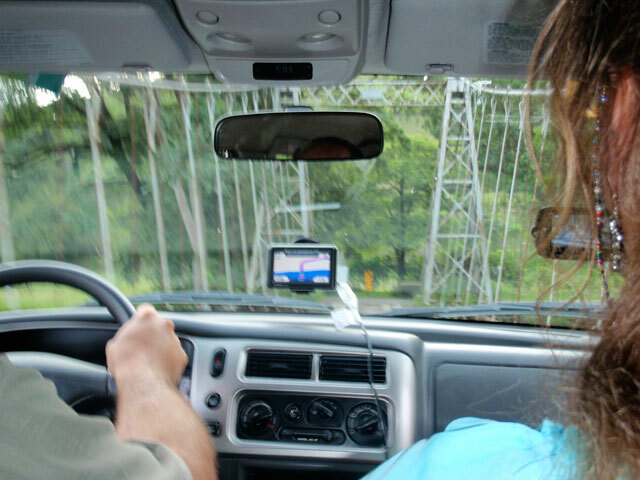 We went to Kiri Tapanti for an afternoon of trout fishing. I would certainly recommend coming here if you are looking for a unique experience. 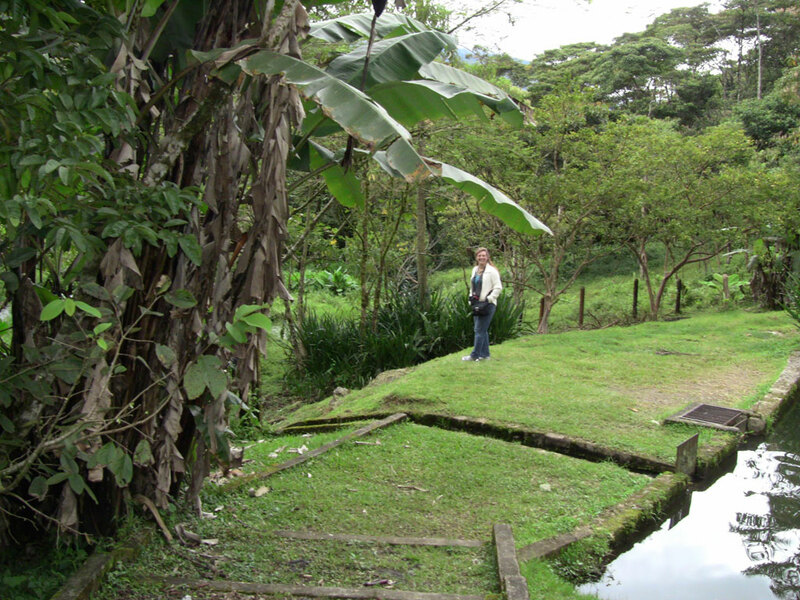 As the following photos will show the grounds are kept pristine and the atmosphere is quiet and relaxing, aside from the occasional squeal when I caught a fish! 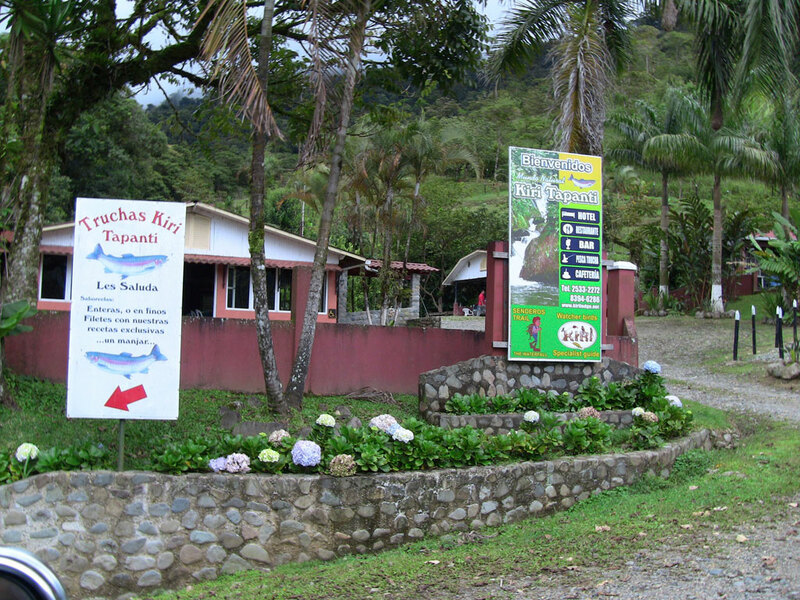 The staff was so friendly, as you will generally experience in Costa Rica. After you have finished catching your fish the staff will clean and prepare them for transport if you so choose to take them with you. The other option is to have the chef prepare your “catch” to dine on at their restaurant. 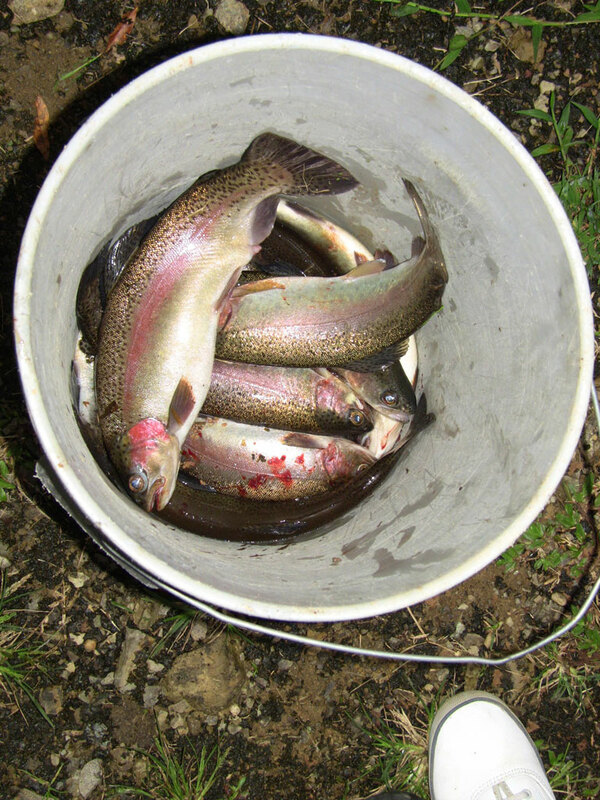 In this case, my husband’s cousin decided to take the fish home with her – we were told they made quite the meal!! There is also a mountain lodge on the property. 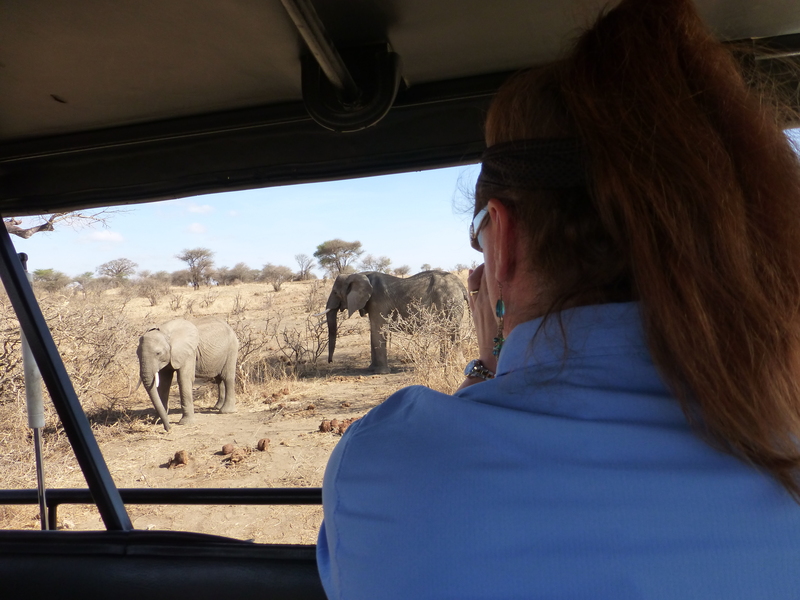 Hopefully, next time we will have the opportunity to stay on their grounds and experience their beautiful lodge first hand. Look at these beautiful grounds. Tell me you couldn’t spend an afternoon here! That’s me – actually spending an afternoon there. The ponds are fed from a mountaintop spring which makes it’s way down into each pond, as opposed to the opposite which is impossible. 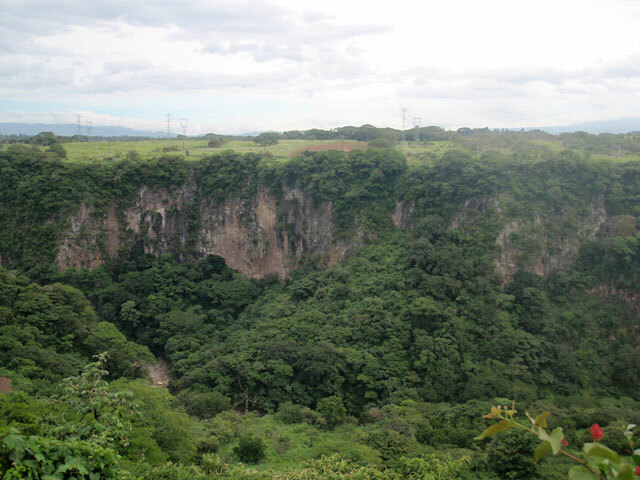 The elevations of the Tapantí region range from 1,200 meters (4,000 ft.) above sea level to 2,560 meters (8,400 ft.) above sea level with an area of 58,500 hectares (145,000 acres). Animal enthusiast alert!!! There are over 45 species of mammals (some endangered), 260 species of birds and 28 species of amphibians, not to mention the hundreds of unique insects, to include the rhinoceros beetle. Which as the name suggests looks like an itty, bitty rhino!! If it is jumpable then it must be jumped!! Obviously, this is an amazing place for kids. Thank you Kiri Tapanti – my kids slept soooo good that night!! We are deep in thought devising a plan…we are coming for you fishies! This is my “OH gosh, I caught a fish – now what do I do?” face. That is my “son without a face” face. These are the faces of defeat. Dun..Dun…Dun..
Until next time…Raisin cookies that look like chocolate chip cookies are the main reason I have trust issues.